Other Names: Beau James, "Gorgeous"
- Mid-South Coliseum (October 16, '73) = Jimmy Garvin, Steve Clements, & Jimmy Kent lost to Randy Curtis, Terry Latham, & DeWayne Peale. - Mid-South Coliseum (July 4, '77) = Jim Garvin & Bob Ellis won the Southern Tag-Team Titles, beating Dennis Condrey & Phil Hickerson. - NWA/WWWF World Title Unification (October 29, '78) = Garvin & Rocky Johnson won, via DQ, over Mr. Sato & Mr. Saito. - NWA World Junior Heavyweight Title Tournament (February '80) = Garvin competed in the tournament, which was won by Ron Starr. - NWA Florida Last Tangle In Tampa (August 3, '80) = Garvin beat Bobby Jaggers. - Mid-South Superdome Extravaganza (November 27, '80) = Garvin took down Terry Latham. 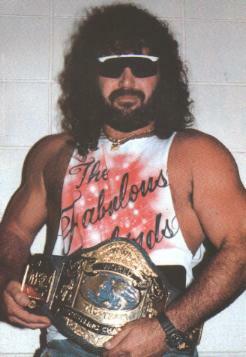 - Mid-South Superdome Extravaganza (April 18, '81) = Garvin & Jake Roberts fell to The Grappler & the Super Destroyer. - Mid-South Superdome Extravaganza (July 4, '81) = Garvin defeated Frank Dusek. - Mid-South Superdome Extravaganza (November 26, '81) = Garvin was beaten by Ed Wiskowski. - WCCW Wrestling Star Wars (June 17, '83) = Garvin lost a "Valet For A Day" Match, via DQ, to David von Erich. - WCCW Independence Day Star Wars '83 (July 4) = Jimmy Garvin lost to David von Erich, who won the vacated Texas Heavyweight Title. - WCCW Labor Day Star Wars '83 (September 5) = Garvin, as the NWA American Heavyweight Champion, lost, via DQ, to Kevin von Erich. - WCCW Thanksgiving Star Wars '83 (November 24) = Garvin lost the NWA American Heavyweight Title to Chris Adams. - WCCW Christmas Star Wars '83 (December 25) = Garvin won back the NWA American Heavyweight Title, pinning Chris Adams. - WCCW Wrestling Star Wars (January 30, '84) = Garvin lost the American Heavyweight Title to Chris Adams. - WCCW 1st Von Erich Memorial Parade of Champions (May 6, '84) = Garvin & Precious fell to Chris Adams & Sunshine. - WCCW Independence Day Star Wars '84 (July 4) = Garvin & Precious lost a "Loser Leaves Town Steel Cage" Match to Chris Adams & Stella Mae French. - NWA/AWA Star Wars (February 24, '85) = Garvin won, via DQ, over the AWA World Heavyweight Champion, Rick Martel. Later on, Garvin & Larry Zbyszko competed in a "Tag-Team Battle Royal", which was won by Sgt. Slaughter. - AWA SuperClash I (September 28, '85) = Garvin lost to the Texas Heavyweight Champion, Kerry von Erich. - NWA Great American Bash '86 (July 5) = Garvin lost an "Indian Strap" Match to Wahoo McDaniel. - NWA Great American Bash '86 (July 26) = Garvin lost another "Indian Strap" Match to Wahoo McDaniel. - NWA Starrcade '86 (November 27) = Garvin fought to a 15-Minute Draw with Brad Armstrong. - NWA Great American Bash '87 (July 4) = Jimmy & Ronnie Garvin defeated Vladimir Petrov & the Barbarian. - NWA Great American Bash '87 (July 31) = Jimmy & Ronnie Garvin fought to a Double Disqualification with the NWA Florida Tag-Team Champions, the Sheepherders. - NWA Starrcade '87 (November 26) = The Freebirds (Garvin & Michael Hayes) & Sting fought to a 15-Minute Draw with Eddie Gilbert, Rick Steiner, & Larry Zbyszko. - NWA Bunkhouse Stampede (January 24, '88) = In a dark match, Garvin & Sting won, via DQ, over the Sheepherders. - NWA Clash of the Champions I (March 27, '88) = Garvin lost an "Amateur Wrestling" Match to the NWA Television Champion, Mike Rotunda. - NWA Clash of the Champions II (June 8, '88) = Jimmy & Ronnie Garvin beat the Varsity Club (Mike Rotunda & Rick Steiner). - NWA Great American Bash '88 (July 10) = Jimmy & Ronnie Garvin, Steve Williams, & the Road Warriors won a "Tower of Doom" Match over Ivan Koloff, Al Perez, Mike Rotunda, Kevin Sullivan, & the Russian Assassin. - NWA Clash of the Champions VII (June 14, '89) = The Freebirds (Garvin & Michael Hayes) defeated the Dynamic Dudes and the Midnight Express to win the vacated NWA World Tag-Team Titles. - NWA Great American Bash '89 (July 23) = The Freebirds (Garvin, Terry Gordy, & Michael Hayes) & the Samoan Swat Team lost a "Wargames" Match to Steve Williams, the Midnight Express, & the Road Warriors. - NWA Clash of the Champions VIII (September 12, '89) = The Freebirds (Garvin & Michael Hayes) retained the NWA World Tag Titles, taking down the Steiner Brothers. - NWA Halloween Havoc '89 (October 28) = The Freebirds (Garvin & Michael Hayes) kept the NWA World Tag-Team Titles, beating the Dynamic Dudes. - NWA Clash of the Champions IX (November 15, '89) = The Freebirds (Garvin & Michael Hayes) won, via DQ, over the Road Warriors. - NWA WrestleWar '90 (February 25) = The Freebirds (Garvin & Michael Hayes) lost to the NWA United States Tag Champs, Brian Pillman & Tom Zenk. - NWA Capital Combat (May 19, '90) = The Freebirds (Garvin & Michael Hayes) lost a "Corporal Punishment" Match to the Rock-n-Roll Express. - NWA Clash of the Champions XI (June 13, '90) = The Freebirds (Garvin & Michael Hayes) were beaten by the Young Pistols. - NWA Great American Bash '90 (July 7) = The Freebirds (Garvin & Michael Hayes) lost to the Steiner Brothers. - NWA Clash of the Champions XII (September 5, '90) = The Freebirds (Garvin & Michael Hayes) fell to the Young Pistols. - NWA Halloween Havoc '90 (October 27) = The Freebirds (Garvin & Michael Hayes) defeated the Youngbloods. - NWA Clash of the Champions XIII (November 20, '90) = The Freebirds (Garvin & Michael Hayes) took down the Young Pistols. - NWA Starrcade '90 (December 16) = The Freebirds (Garvin & Michael Hayes) fell to Tommy Rich & Ricky Morton. - WCW Clash of the Champions XIV (January 30, '91) = The Freebirds (Garvin & Michael Hayes) took down Tommy Rich & Allen Iron Eagle. - WCW WrestleWar '91 (February 24) = The Freebirds (Garvin & Michael Hayes) won the WCW World Tag-Team Titles, beating Doom. - WCW Superbrawl I (May 19, '91) = The Freebirds (Garvin & Michael Hayes) took down the Young Pistols. - WCW Clash of the Champions XV (June 14, '91) = The Freebirds (Garvin, Michael Hayes, & Badstreet) fell to Tom Zenk & the Young Pistols. - WCW Great American Bash '91 (July 14) = The Freebirds (Garvin, Michael Hayes, & Badstreet) lost an "Elimination" Match to Dustin Rhodes & the Young Pistols. - WCW Clash of the Champions XVI (September 5, '91) = The Freebirds (Garvin & Michael Hayes) defeated Todd Champion & Firebreaker Chip. - WCW Halloween Havoc '91 (October 27) = Garvin was pinned by Johnny B Badd. - WCW Starrcade '91 (December 29) = Garvin & Marcus Bagwell took down Michael Hayes & Tracy Smothers. Later on, Garvin competed in the "Two-Ring Battle Bowl Final" Match, which was won by Sting. - WCW Clash of the Champions XVIII (January 21, '92) = The Freebirds (Garvin & Michael Hayes) won over Brad Armstrong & Big Josh. - WCW WrestleWar '92 (May 7) = The Freebirds (Garvin & Michael Hayes) won the WCW United States Tag-Team Titles, defeating Terry Taylor & Greg Valentine. 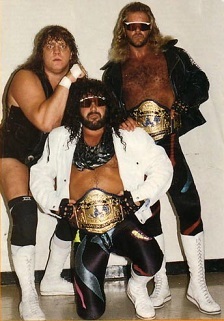 - WCW Clash of the Champions XIX (June 16, '92) = The Freebirds (Garvin & Michael Hayes) beat El Texano & Silver King. - WCW Great American Bash '92 (July 12) = The Freebirds (Garvin & Michael Hayes) were beaten by Hiro Hase & Shinya Hashimoto. - WCW Superbrawl IV (February 20, 94) = Garvin fell to Johnny B. Badd.